For the curious, here are links to 2008, 2009 (a bad year), 2010, 2011, 2012 (when we left the blog behind), 2013, 2014, 2015, 2016, and 2017. Ten years ago, Dr. Girlfriend and I kicked off the Easter Zombie Movie Marathon (because, you know, the resurrection!) and for the tenth anniversary marathon, we’ve decided to go back and rewatch some of the best films from (nearly) every year. We had to make a few cuts here and there to have time to end the week with a tribute to the late, great George A. Romero on the 50th anniversary of the release of Night of the Living Dead. While Romero made six total Living Dead films, the final two, Diary of the Dead and Survival of the Dead, are not technically continuations of the series so much as reboots, taking place during the opening months of the resurrection of the dead. As such, for this project we thought we’d stick with the original narrative run. So without further ado, here’s an all-new discussion of Romero’s fourth zombie outing, Land of the Dead. 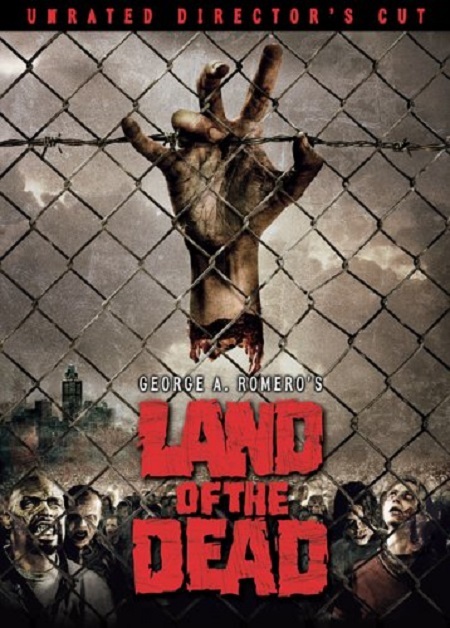 The twenty years between Day of the Dead and Land of the Dead were fairly lean with regards to George A. Romero feature film projects. As the television anthology series he produced, Tales from the Darkside, wrapped in 1988 he released Monkey Shines, then two years later directed a segment in the anthology film Two Evil Eyes alongside Dario Argento. It was another three years before his Stephen King adaptation The Dark Half hit theaters and then it was another seven before the forgettable and frankly questionably-thought-out straight-to-DVD film Bruiser was released in 2000. His revised script for the Tom Savini-directed remake of Night of the Living Dead (1990) was the brightest spark of this period and remains one of the best zombie films of the decade. His 1998 live-action commercial for the videogame Resident Evil 2 so impressed Capcom that they wanted him to direct the upcoming feature film, however Romero declined at first before reconsidering and turning in a script. Unfortunately, that was eventually scrapped in favor of Paul W. S. Anderson’s take. And then something happened in pop culture. That Resident Evil movie he’d initially passed on became a huge box office success, grossing more than $100 million worldwide and suddenly zombie movies were on the U.S. radar again (overseas, zombie films had barely slowed down over the prior decade). 2002 saw the release of both Danny Boyle’s 28 Days Later and Resident Evil, followed in 2004 by Zack Snyder’s remake of Dawn of the Dead, the Resident Evil sequel Apocalypse, and the British horror comedy Shaun of the Dead, directed by Edgar Wright. Romero had been working on the script for Land of the Dead since 2001, sending the first version to his agent just two days before the September 11 attack, which meant that studios weren’t ready yet for what Romero had in mind. It wasn’t really escapist entertainment and was more about what all his Living Dead movies were about: people trying to get by in the face of apocalypse. After negotiations with 20th Century Fox broke down (they wanted to get the rights to the Night of the Living Dead franchise), Universal stepped in with a budget of between $15-19 million – the highest of any of Romero’s pervious Living Dead films. It was also the first film in the series to actually be released with and MPAA rating for its theatrical release and with an eye to the home video market, he filmed in a way that easy alterations could be made to secure an R-rating while still ensuring an unrated DVD release. While I don’t think anyone would go so far as to say Land of the Dead is the best film in the series, the budget certainly did allow for it to be the most professional-looking installment. Greg Nicotero was on-board doing the visual effects, which stay practical as much as possible with some CG enhancement here and there. 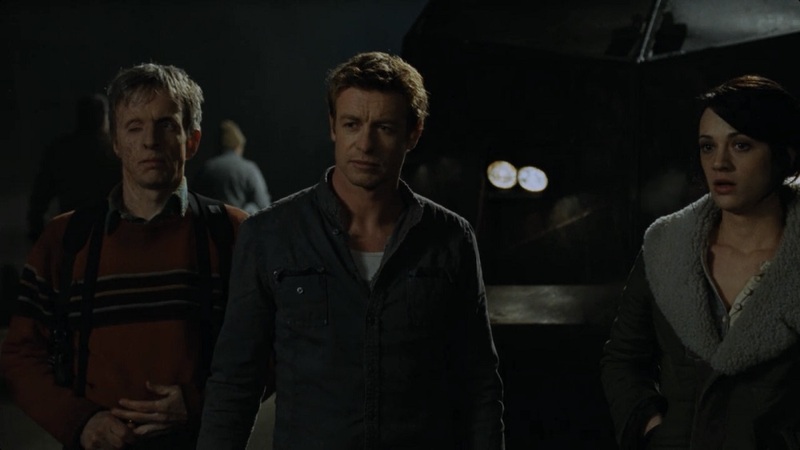 The cast was also the most impressive of the series, featuring Dennis Hopper, John Leguizamo, Asia Argento, and Simon Baker as the lead, Riley Denbo. In the years since the dead rose and overran the planet, the last surviving human beings have set up outposts across the U.S. and our story takes place in Pittsburgh (although it was filmed in Canada). The rich and powerful live in a luxury high-rise called Fiddler’s Green while the rest of the city’s population struggles in poverty and squalor. Hopper plays Paul Kaufman, the ruler of the city, who finances Riley’s and Cholo DeMora’s (Leguizamo) supply runs out into the infected landscape. Riley and Cholo represent the central conflict of the film, that between self-interest and altruism. Riley is more concerned with making sure the needs of the people are met, while Cholo is more interested in improving his own social status. Neither character is purely good or evil, with both existing in a gray moral area as even Riley’s charitable acts are supplemental to his own desire to abandon the city. On the other hand, Kaufman is simply evil. Rich and evil. As with most of Romero’s villains, he can be cartoonish in his disregard for others and obsession with maintaining his own power and influence. The social criticism here isn’t quite at the level of the earlier films, but in the end it becomes almost secondary because while all that drama is going on, Romero introduces what could be considered Bub 2.0, a zombie known only as Big Daddy (Eugene Clark). Big Daddy has begun to develop self-awareness. At first, he’s more on the Bub level of having vague sense memories of things he’d done in life (he worked at a gas station and is first seen responding to the ringing of the service bell before exhibiting limited communication skills), but as the film progresses, he becomes more and more aware of his surroundings and the treatment of “his people” by the humans. He experiences anger and anguish as zombies are mowed down around him during a supply run, and is compelled to track the scavengers back to Pittsburgh, leading a growing army of the undead who are likewise compelled to follow him. Clark’s performance as Big Daddy is broad but effective. There’s a sense that the dead are missing something vital in their decomposing state; community. They are a horde but they are not a group. Big Daddy’s awakening serves as an example to others, and like a plague, awareness starts to spread and Pittsburgh is eventually overrun because Big Daddy outsmarts the city’s protectors. The final scenes allow Romero to make the explicit comparison that he’s been implicitly building toward over forty years of zombie films: the living and the dead are essentially the same. As Riley and his small band of survivors flee the city to head for Canada, he sees Big Daddy and other zombies milling around Pittsburgh and opts not to launch rockets at them, observing that they’re just looking for a place to go, too. There’s even a bit of ambiguity with the ending as, according to Romero’s commentary track on the Blu-ray release, while most zombies are still hungering for human flesh, the followers of Big Daddy are more evolved, forming a new tribe of sorts. It would have been interesting to see where Romero went next if he had continued following the timeline instead of going back and revisiting the beginnings of the undead rising. Overall, Land of the Dead is a solid entry in the series – the last solid entry, unfortunately. The themes aren’t quite up to those from the past but what we lose in philosophy we gain in film quality. At times it was hard to remember that this was a George Romero film as it lacked that handmade feel that characterizes most of his catalog. Also, if you keep your eyes peeled, you’ll catch Tom Savini, Simon Pegg, and Edgar Wright cameoing as zombies.